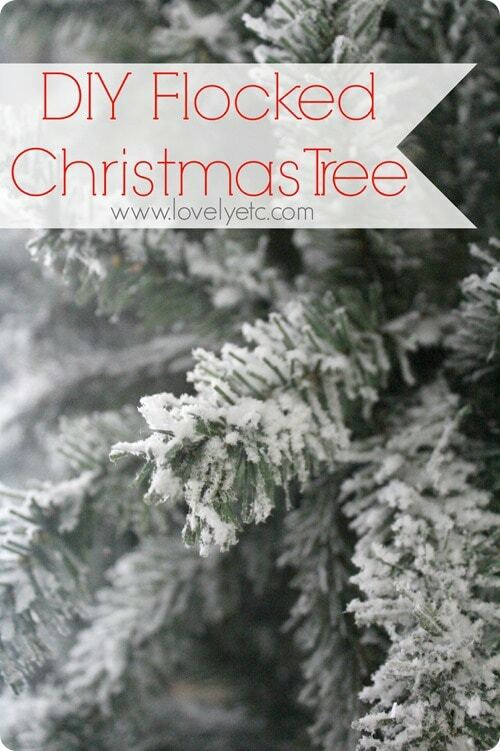 DIY Flocked Christmas Tree - Lovely Etc. This year, I really, really wanted a flocked Christmas tree. So when buying one wasn’t really a possibility, I decided to turn my old fake Christmas tree into a DIY flocked Christmas tree. And it turned out amazing! Flocked trees are those vintage-y white ones. Not the ones with white plastic needles, the ones that are white with a snowy texture. Some are all white and some are a little white with plenty of green still showing. I even casually checked some out while I was shopping, thinking maybe I would find a killer sale. But no such luck, and I just couldn’t justify buying one, especially considering I already had a perfectly nice artificial tree at home. So, of course, the next logical step was to figure out how to turn the tree I already had into a snowy masterpiece. This post contains some affiliate links. See my full disclosure here. I turned to Pinterest and started searching for ways to flock your own tree. I found lots of different ways involving soap flakes, white glue, glitter, even spray paint. But when I looked at the results, they really didn’t look much like a real flocked tree at all. 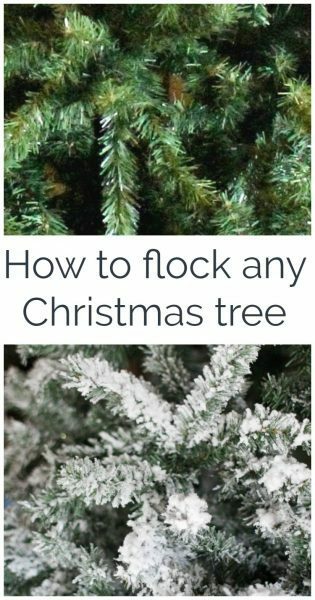 I only found one picture that showed a really great looking flocked tree and when I clicked on that one, the blogger had used the kind of flocking material that florists and other professionals use. It only makes sense I guess – if you want it to look like the real thing, you need to use the real stuff. I really wasn’t sure how much flocking I would need so I went for the five pound box. I figured it was better to have too much than too little. In the end, I probably used a little less than half of the 5 pounds flocking my tree. Our tree is seven and a half feet tall and I flocked it very lightly with plenty of green still showing. If I had wanted it completely white, I think I would have used the whole box. The flocking is a powder that came in a big box. The only other things you need to create your own DIY flocked Christmas tree are a spray bottle of water and a strainer. I should mention that before I flocked our tree, I did something else slightly crazy to it. Last year over half of the lights on our pre-lit tree burned out. I just unplugged them and threw on a bunch of other strings of lights. This year, since I knew I was going to be making our tree beautiful and snowy, I didn’t really want to cover lots of old nonworking lights with flocking, so I cut all of the lights that came on the tree off with wire cutters first. This probably took around three hours and was completely unneccessary but I’m glad I did it. We are most likely going to have this tree for many more years and now it is good as new again. 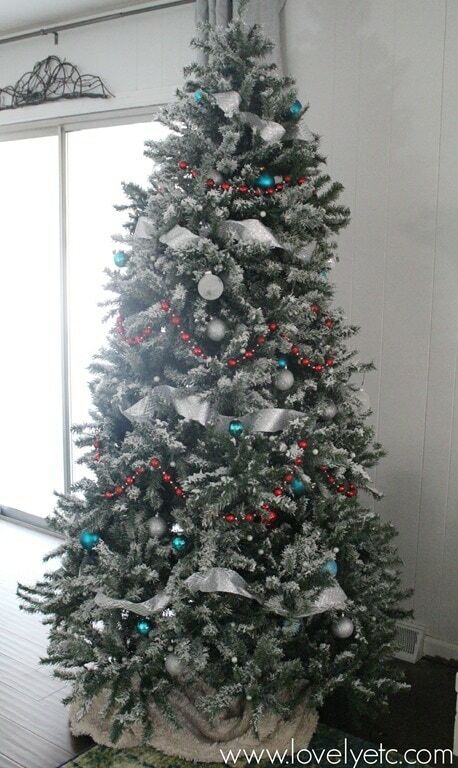 You can flock real trees, fake trees, pre-lit trees, wreaths, garlands, pretty much anything. And you certainly do not have to remove the lights from your pre-lit tree first – that’s just a little of my crazy showing. I made a quick video to show how easy it is to flock a tree. Or if you prefer, there are written directions and pictures below. 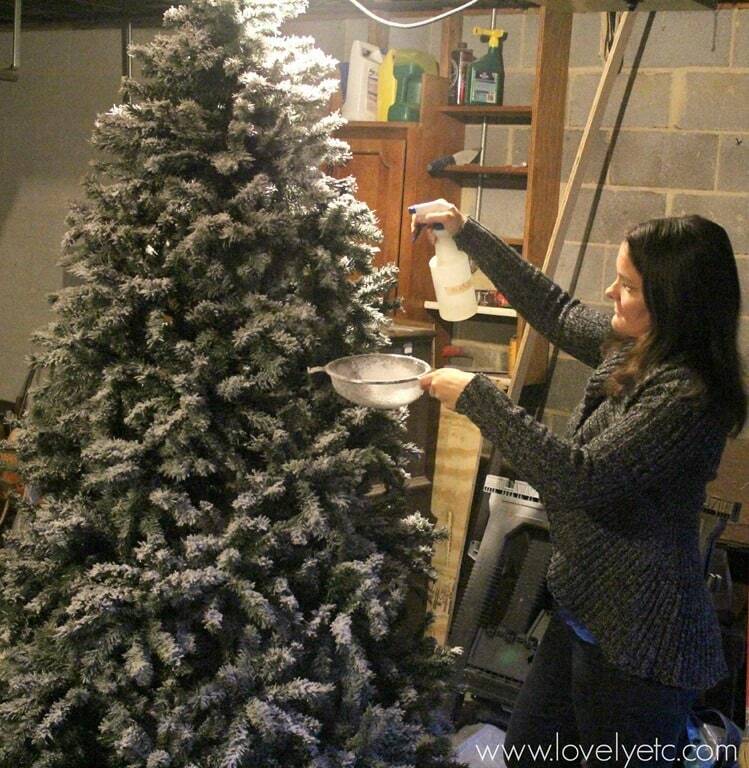 Use your spray bottle to lightly mist a section of the tree with water. Scoop up some of the flocking into your strainer and sift it onto the damp tree. Spray the flocked section of the tree with water again. The water activates the adhesive, fluffs up the flocking, and seals it all. (By the way, you don’t want to accidentally mist your sifter with the water – it will fluff up the flocking before it is on the tree and stop up the sifter). Continue to do this moving from section to section. Afterwards, if you would like your flocking fuller, go back and add more water and more flocking. As you can see, I flocked my tree when it was already put together. If you want yours to be more thoroughly white, you may want to take apart the sections so you can better reach the inner branches. 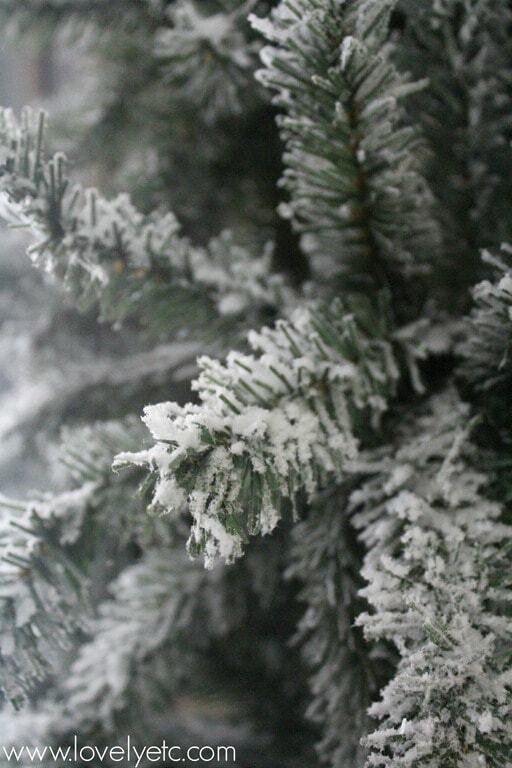 I love how much it actually looks like a snowy evergreen! You are going to have to let everything dry. This takes between 6 and 72 hours. The more thickly you flock it, the longer it will take. I flocked my tree in the evening, let it dry overnight, and the next morning it was ready to move upstairs and decorate. This is by far my favorite Christmas project ever! Check out the before and after – the flocking just made such a difference. I’ve gotten a lot of questions about this project so I put together an update on how my tree is holding up after a year plus answers to frequently asked questions right here. I am obsessed with this! I have a small six foot tree still in a box! I think we can make it happen! Thanks for sharing this tutorial!!!!!!!! Thanks Amber! I am totally obsessed with it too! This is a project that I have been wanting to do. The DIY’ers seem to use soap flakes and starch – both of which have smells that I react to with migraines. Did your flocking have any smell at all? Is it just called flocking? Will it last through more than one season? Thanks for sharing. Teri, It did have a smell when I was putting it on – I’m not sure what exactly it was, probably the adhesive that is activated by water. It is called flocking in general but the brand I used is called Sno Flock. And I can’t say for sure about how it will last, but it supposed to last more than one season. I guess I will find that out for sure next year! Would canned snow give the same effect? yes! This looks amazing, Carrie! Sometimes it’s worth using “the real thing,” right? Makes me want to flock everything! Me too! Thanks Chaney! It’s true – sometimes it really is worth it to use the best materials instead of looking for a cheaper version. Not always, but sometimes. I love it! I wonder how long it will last??? Thanks Cheryl! I am wondering the same thing! Hopefully at least a couple of years. I belong to a garden club that does a Xmas house tour to raise money. We do all of the decorating of four houses in our community. We love the idea of flocking our tree and greens, but I have only found one website that sells the flocking and the shipping doubles the price. I didn’t find anywhere to buy 5 lbs for $40. Could you please share where you purchased your materials? Thanks for sharing your memories Gail! I really love our flocked tree and can’t wait to get it out this year. Thanks Jennifer, I am planning to post about that in the next few weeks! Rebecca, I am posting next week about how things went with storage and touching up, etc. I’ll save all the details for then, but I will say I have zero regrets about flocking it. This is amazing, and exactly what I was looking to do! Thanks for sharing. Heather, I’m so glad to help! I seriously love my flocked tree. Is this products safe for use with household pets?? I am not sure, but I am guessing it probably would not be good if a pet consumed it. The package of flocking I purchased did not say anything about safety. Carrie, can’t wait for your comments (Thursday, Nov. 19) to see how things went with storage and touching up, etc. as I’m planning to flock my Christmas tree next week. Your tree looks gorgeous, Carrie! I’m totally using your tutorial to flock mine this year. Yay! Thank you, thank you, thank you!!! Your post and DIY flocking tutorial are exactly what I have been searching for. I was so close last year to doing the spray paint/glitter technique but as you said, I just could not find any photos of ones that used this method and actually looked like a real snowy tree. 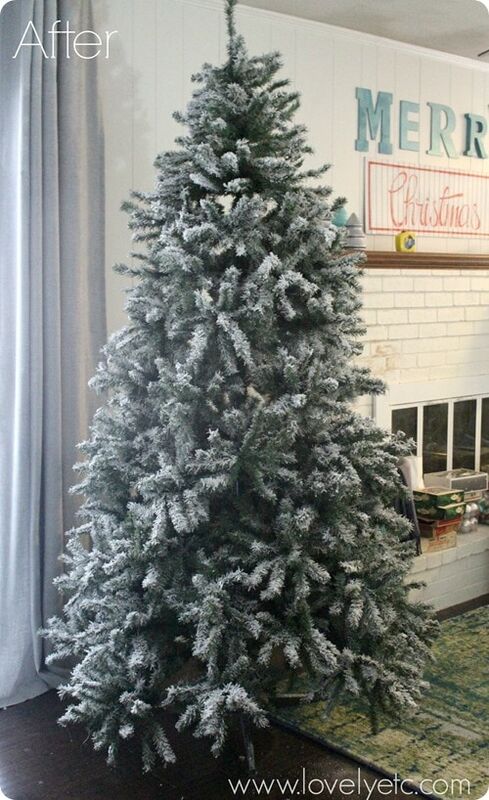 Your flocked tree is absolutely breathtaking and looks so real! I am totally willing to order some flocking and give this a try this year! Totally worth the mess! I just hope mine turns out as gorgeous as yours. Thank you so much for posting!! Can’t wait to get started! Thanks Stasia! I am glad I could help – I hope your tree turns out exactly the way you want it! Do you think this would work on an old flocked tree – to kind of freshen it up? I think it’s silver underneath the flocking. I think that it would but I have never done it. I used it on the same tree again this year to freshen up and it worked great. That’s not exactly the same thing but since it will stick to real or fake trees, I’m pretty sure it will stick to older flocking as well. For what it’s worth, in the 1950s there was no flocking available. My mother, a very inventive person, took powdered laundry soap, mixed it with a small amount of water, then whipped it in her Kitchenaid mixer to make it fairly stiff. Then she would take a small amount in her fingers and draw it along the ends of the branches so that it looked like it had just snowed. Our neighbors couldn’t get over the fact that it looked so real. This could be an alternative but I’m not sure how it would store as she used it on real Christmas trees. I have heard of this before but of course haven’t seen it. It sounds like a very inventive way to get a beautiful look! They make flocking machines that you can use. There is a bottle you put water and the flocking in. You hook it up to a vacuum cleaner set to blow out instead of vacuuming up. Interesting, I haven’t seen this before. Carrie, Years ago my dad used to flock his tree most every year. He, of course, bought a real tree. He used some kind of attachment to the vacuum cleaner. We had an old electrolux. You could change the hose to the opposite end so that it would blow. I remember him using a garden hose to get it wet first. You might check on amazon or ebay for one of those nozzles. Gail, that is really interesting. I haven’t seen anything like that – I wonder if they still make them? I will have to do a little searching! I love your tree! Thx for sharing. I am decorating a large atrium and there are several trees that I would love to flock but I’m wondering if it can be washed off the trees if we change the atrium design another year. Gayla, decorating a large atrium for Christmas sounds like so much fun! I imagine it being very beautiful! I don’t know if it is possible to wash the flock off because I haven’t tried. But I would imagine that even if it is possible, it would be incredibly messy and labor-intensive to do. I probably wouldn’t recommend using the flocking if you think you may want to remove it later. I had a 9 year old tree with lights that weren’t all working. I decided to try and flock the tree. This was SUPER easy and I love the results. Plus I was able to fix my lights! The tree looks beautiful now. I can’t wait to start decorating. This sure beat going out and buying a flocked tree since they are very expensive. Thanks sharing this information! Yay, I am so glad you went for it. Adding flocking really does give an old tree new life and when you do it yourself it is so inexpensive too! Have a great Christmas! I’m wondering will putting on the lights knock off the flocking or should I pre do the lights then add the flocking? Any idea if color can be added to this? I’ve got an old fake tree we’re wanting to do something crazy with as a surprise from our elf. Haha. Tina, What a fun idea! I haven’t tried adding color but I bet you definitely could. You may be able to color it with food coloring or dye. Or you could just add some brightly colored glitter as you flock. I did see blue and pink flocking for sale a couple of years ago but I haven’t seen any yet this year. Good luck! This is truly the easiest decorating you will do all year. I flocked by 7′ Frazier Fir and used about 1 – 1 1/2 pounds of the flocking powder. It took me about 20 minutes. My tree looks frosty, not snow laden. It is beautiful. I got so many compliments at our annual Christmas party and no one believed me that it was so easy. It was! I’ll do this again for sure. Yes, it is so easy and crazy how beautiful the results are! I bet your part was beautiful with your flocked tree! This turned out beautifully!!! I’m going to do this for Christmas this year for sure! I really recommend mentioning wearing a dust mask if all it takes is moisture to set up the flocking. You definitely don’t want to breathe that stuff in. Do you know if the flocking can be taken off just incase i want a green tree the next year? You might be able to remove it but it would probably take quite a bit of work. If you just wanted most of the flocking gone, you could probably knock a lot of it off with a broom or brush, but removing every bit of snow wouldn’t work well. Even though it loses some flocking over time and with use, the flocking is meant to be permanent. It was very popular to “flock” your own Christmas tree in the 1950s and 60s. I can’t remember ever having a green tree as a kid. The kits came with a 1 to 1/2 lb bag of flock and a flock gun and water cup. These would be attached to the end of a vacuum hose that was connected to the exhaust end of the cleaner so it would blow out. The water cup was used to wet the tree down really well and then you’d refill it and use the flock bag which attached to the gun on the side with a special clip and between the dry flock and the spray of water you’d be flocking your tree. It was beautiful and is the way the pro’s did it except with big machines instead of household vacuums. And yes you could tint your tree any color by adding food color (some kits came with special color packets) to the water. Real flock is flame retardant and non poisonous to children and animals. Because it’s really a paper mache’ product when the tree dries the flock is “bonded” to it but still has that soft snowy look. *If you ever try one of these vintage kits do it outdoors or in a garage with drop clothes. It’s very messy but the results are like the professional (and very expensive trees). Thanks Eddy! It seems like the flocking product is similar to what I used but the application is definitely different! Isn’t it funny how trends seem to come full circle so often. Thanks Alexsha! 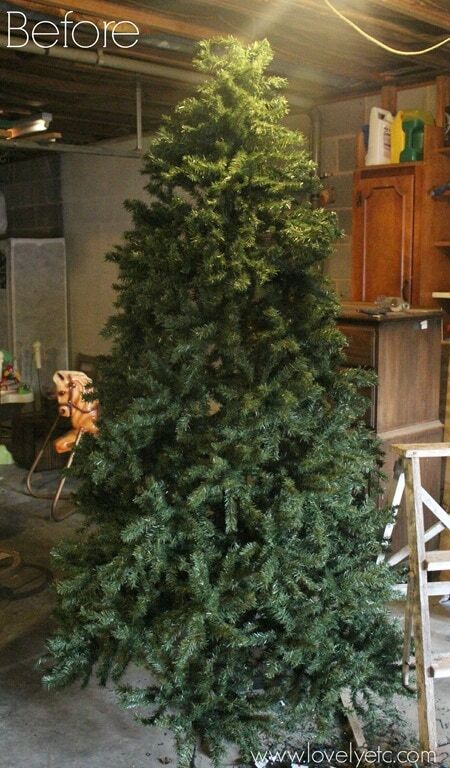 I’m lucky enough to have a big basement so we just carry our tree downstairs to store it without taking it apart. We did this before I flocked it as well simply because it saves the hassle of putting it together each year! We used to have a tree like yours and if you did flock it, you would just need to be prepared to lose some of the flocking whenever you take it apart and put it back together. Hi can you please post a link of the flocking you used i tried the one above and it came up with a snow globe. desperate to try this! I SO want to do this but the entire internet is sold out of snoflock except the link above and it won’t arrive until January 15th….bummed. is there another brand that self cliffs like this? Cathi, That is such a bummer! Sno Flock is the only brand I have personal experience with – but this flocking looks like a very similar product. It might be worth a try: http://amzn.to/2iYAOKv. I bought mine from Amazon. The brand I use is sold out until after Christmas but this looks similar and has good reviews: http://amzn.to/2BYjJaP And 2 lbs should cover an 8 ft tree pretty well. Good luck! dose this flock last for years or dose it come off? Hi Jan, It’s a little bit of both. The flock does last for years but will slowly come off over time, especially as the tree is jostled when you are putting it up and decorating it and then taking it down again. After two years without adding any more flocking, our tree was still flocked but a lot more green was starting to show through. I plan to add a bit more flocking next year and experiment with sealing the flocking. Every year we get a Fresh Cut tree can a fresh tree be flocked? Elizabeth, yes you can flock a fresh tree using the same method! Even better, then you don’t have to worry about it making a mess when you store it away for next year. Carrie thank you very much for sharing! Your post is just what I was looking for, I really want a flocked Christmas tree and the snow in the spray bottles is not a good option for me, looks very messy… But the material you used looks amazing! your Christmas tree looks fantastic! !